Fellow humans, it is my duty to inform you that artificial intelligence has officially taken over the world. Well, the world of media and marketing, at least. If your Twitter feed hasn’t been bombarded by the surreal and psychedelic images of Google’s DeepDream or news of IBM’s Watson’s latest feat of intelligence (Spoiler alert: Right now, Watson is trying to cure cancer. ), don’t worry. It will. Artificial intelligence has been front and center recently, and for good reason. Artificial intelligence is fundamentally changing the way the world functions–everything from healthcare, business, insurance, finances, to entertainment, web searches, and more–and the changes only accelerate from here. 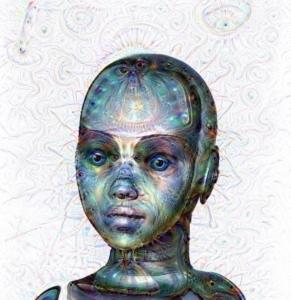 This is a picture of an android processed through DeepDream. Marketing hasn’t received a pass on these changes. If anything, artificial intelligence is being utilized in marketing more than nearly any other field. In fact, it’s expected that by 2020, a whopping 85% of customer interactions will be managed by artificial intelligence, according to Gartner. Artificial intelligence helps keep things natural with natural language processing (NLP). No, we’re not talking about whether or not a robot-body-wielding Siri will choose Whole Foods, Trader Joes, or Earth Fare. Like most things in marketing, it’s all about the content. With Google’s perpetually changing algorithms, the days of keyword-stuffing worthless content like it was last year’s Thanksgiving turkey are long gone. SEO has undergone fundamental changes, and it’s clear that Google continually tries to reward content that is fresh, useful, and answers questions. Google supports searches containing complex questions, which is good news, because more and more people are using yet another artificial intelligence technology, voice recognition. With assistants like Siri, people do not generally utter a random string of keywords, but instead speak as humans do, with natural language often in the form of questions. Google uses RankBrain to help determine what searches may be related, even if the keywords don’t match 100%. 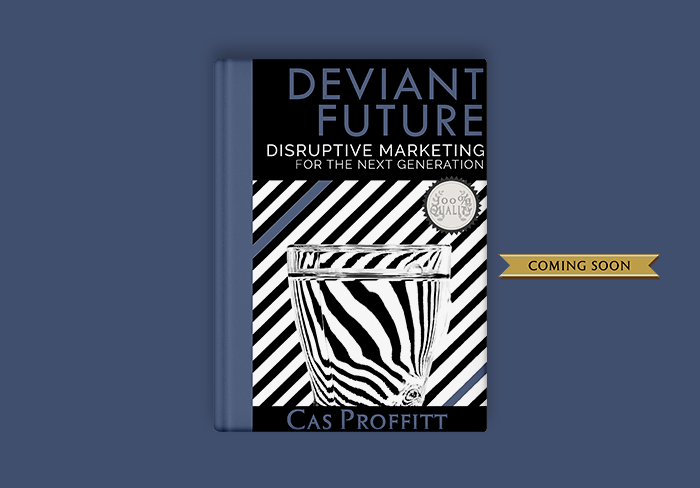 Be the first to know when the book is released, and use disruptive technology to gain an edge on your competition. Because of Google’s adaptations to new technologies such as voice recognition, it is easier for content marketers to write articles and blog posts that mention keywords naturally while still being able to gain authority and pagerank with Google. So, if you’re still stuffing in keywords, focus instead on presenting valuable content in natural ways. Hit the bullseye with behavioral targeting. There are tons of services that help marketers use behavioral targeting run by artificial intelligence in a variety of different fields. Even now, as I write this post in Google Docs, I can click the explore icon in the lower right, and up pops all kinds of articles related to what I’m writing. One way to start implementing behavioral targeting now, is to use a feature-rich CRM like Salesforce that harnesses artificial intelligence to give you insight about your client base. When you know more about your customers, you can update your models about who you’re targeting and when. Receive the gift of prophecy with predictive analytics. Not only can artificial intelligence help you pinpoint common behaviors of your leads and customers, but it can sometimes predict what they want or need before they even know themselves. Companies like AgilOne use machine learning to show marketers where opportunities lie with their customers. They analyze customer behaviors and preferences to better allow marketers to understand when the time is right to offer content and products depending on the customer’s stage of the buying cycle as well as the likelihood of repeat sales, first purchases, and more. Another predictive analytics company, 6Sense, helps marketers learn both what and when customers will buy, thereby helping marketers know which parts of their content strategy to utilize when. React to your customer’s intentions. Whether you run an e-commerce site or a blog, don’t just let it sit stagnant as your customers abandon their carts and your content. While there are a variety of intention strategies, some more complex and AI-intensive than others, using exit-intent tools is an easy and affordable way to supercharge your marketing. With exit-intent tools, your pages react when they see a customer is about to lose interest. 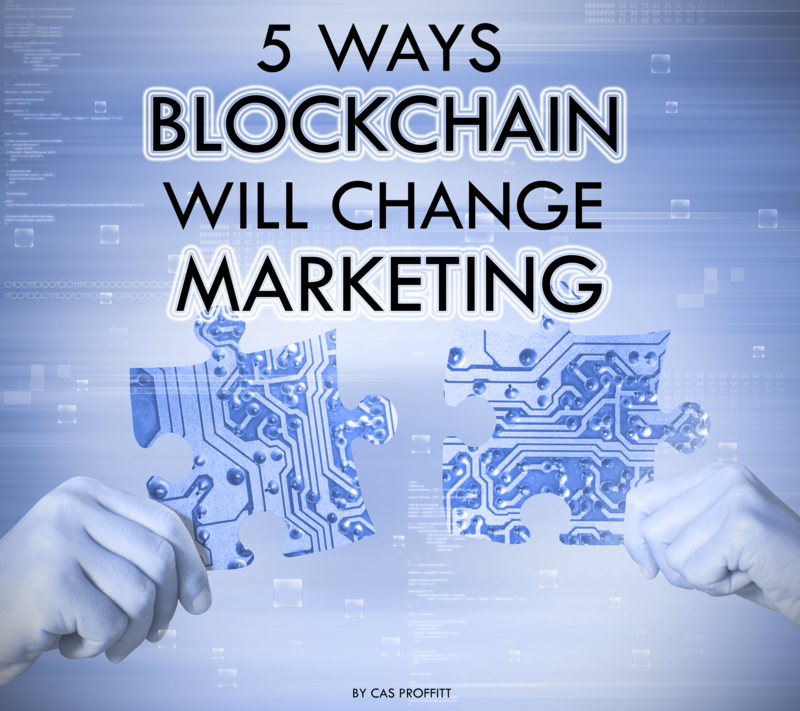 Of course, you can also be proactive, and provide your customer something that could benefit them, such as an ebook or course, once they have shown sufficient interest. For me, Thrive Leads has been a game changer on this front, and is something I now offer to all of my clients as well, included in their price, because I want to see them succeed. If Thrive specializes in anything, it’s success. Thrive is an invaluable tool in any content marketer’s arsenal. One reason for this is because rather than bombard your prospective lead with a giant popup before they even know if they care about what you write/offer/sell, you can choose when a customer has shown sufficient interest, like after six paragraphs. Back to exit intentions. Exit-intent technology gives you a few extra seconds to capture your customer’s attention, and either the sale through coupons, etc. or their email address which may, in turn, lead to a sale. Whenever you see a page that offers you an ebook download or something similar right as you go to click out of the page, they are using exit-intent technology. Another great (and free!) way to implement an exit-intent strategy is this neat little tool that lets you change how your tab is displayed in your customer’s browser whenever they have a different page open instead. It coaxes them with a little intrigue to come back and see what you have without being too in-your-face. None of these listed above would be considered artificial intelligence, but they are helpful, especially if you use them alongside the AI-heavy head honchos of understanding intention. On the more complex side of intention analysis are companies like Conversica and 6Sense. 6Sense, as mentioned above, can accurately ascertain when a customer is ready to buy. Conversica helps pre-qualify leads and nurtures them until it sees they have the intent to buy. Marketing automation has gone from a buzzword to a way of life for many content marketers. There’s no more time to waste time on things that can be automated, at least as long as that automation functions as good or better than you do. Whether that is lead nurturing through Conversica, product recommendations, dynamic pricing, follow-ups, assistance with customer segmentation, or anything else marketing, there’s probably a tool for that. One artificially intelligent marketing automation tool that has caught my eye lately is BoomTrain which helps marketers build profiles of customer behavior and personalize content accordingly, as well as give insight into unmet needs. Strike up a conversation with your leads. What if you could free up the back and forth time of emailing and nurturing leads, and instead leave the task to an AI who is better equipped than you to glean data from the task? Back again to Conversica, their artificial intelligence platform handles lead nurturing, and appears to your customers as if they are having a real conversation with a person. Of course, it hands them off to you to make the sale. I’ve been engaging directly with the Head of Marketing at Conversica the past few days, and will be having a call with him next week. What I’m most interested to know–were my email conversations actually with an AI? If so, that definitely proves its effectiveness to me. Watch this space, because after he and I talk, I’ll have more information to hand off to you guys, and will do a post about this platform probably next week. Back to the 85% statistic. If most of our communications won’t be with people, then who? Artificial intelligences who can be available any time. These chatbots aren’t the SmarterChild of the past,changing topics whenever it suits their fancy, but are attuned to your customers needs. Chatbots help marketers by doing repetitive tasks such as emailing leads to set up phone times or by offering basic customer service. Of course, you don’t want to leave out the human element when speaking directly to your customers and potential customers. But, nowadays, AI are learning how to determine the emotions of respondents, and are better equipped to handle a wider range of scenarios. They also know when to hand a conversation off to a human. Boomtrain and Conversica are practically taking over this list as it pertains to customer communications, but both of these previously-mentioned services also offer chatbots. Show ‘em what they want with content curation and filtering. With over 500 million tweets (that’s HALF A BILLION, folks) sent every single day, it’s important to show your customers exactly what they want to see, else a ton of other sources will be happy to do so. Artificial intelligence-driven content curation helps marketers determine exactly what content customers are looking for, where to find it, and how well its working for them. Tools such as TrapIt!, bring together sources and measure data to ensure the content you share works for you. As for content filtering, massive companies like Facebook already do this, filtering everything from posts to ads based on your past behavior to serve you up the content best suited to your tastes, all the while collecting more information to do it better in the future. You can implement the same tactics using recommender systems that use artificial intelligence to interpret user data to determine what to show them next. If you’re tech-savvy, you can even use the same opensource AI system Amazon utilizes to recommend products, called DSSTNE (destiny) for free. Not all content can be curated, sometimes you still have to create it. While artificial intelligences aren’t taking over my job just yet, and there’s still a need for custom, creative, and authoritative content, some content can now be automatically generated. A better implementation of AI-generated content for content marketers is for repeating, data heavy reports. Tools such as Wordsmith allow marketers to create dynamic templates through which they can feed their data to automatically create custom, natural-sounding content. Artificial intelligence can help you out in other ways with personal assistance. Not all content marketers can afford to hire a human personal assistant, and some don’t want the hassle. However, there are AI-based solutions that can handle tasks better than many humans. Focus your creative energies on your campaigns instead of everyday tasks, such as scheduling meetings. One tool I’m personally on the waiting list for is x.ai, an artificial intelligence that handles back and forth emails to determine meeting details. I’ll update this space once I’ve gotten a chance to try it. Also, x.ai did a great job with their own marketing practices by offering a bump on the waitlist for social shares–very nice! There are tons of AI assistants on the market, but another AI who looks very promising (and is outside the ultra-common like Siri and Cortana) is Aido, who can play with your kids, help you fix your house, cook dinner, and comes whenever you call. He even charges himself. 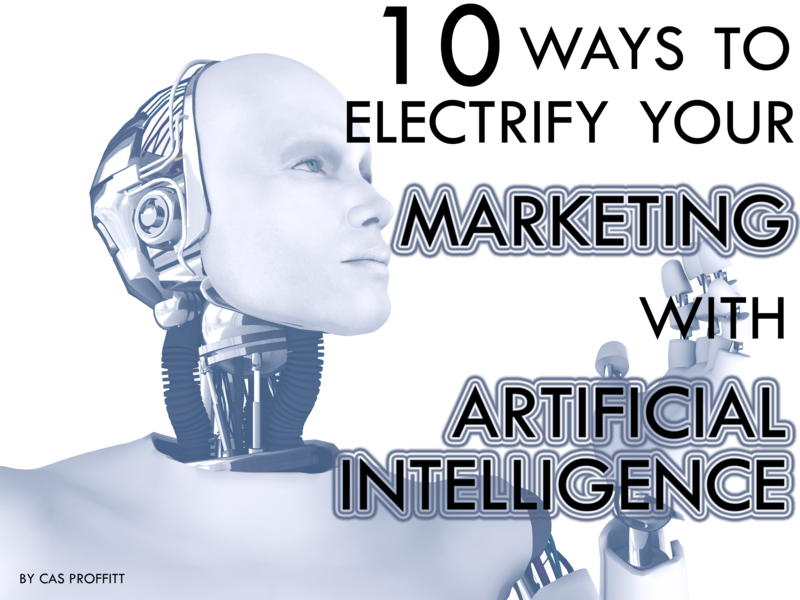 How are you using artificial intelligence in your marketing? Let me know in the comments below! I am a B2B content marketer and brand consultant in the field of disruptive technology. I work with businesses on topics such as Artificial Intelligence, Virtual Reality, Augmented Reality, Big Data, and Blockchain. 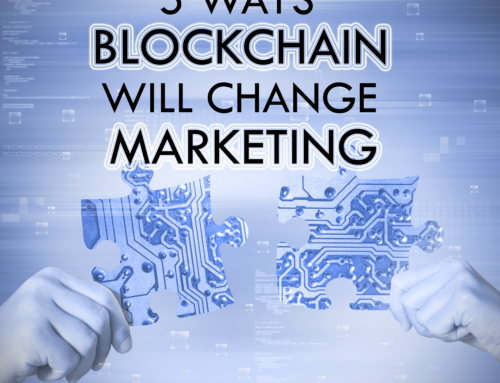 Through the use of blogging, white papers, email marketing, ebooks, visual content, and more. I help businesses storm new markets. Connect with me on Twitter, Facebook, Google+, and LinkedIn. Get updates about the release to learn why Gen Z & Alpha + Artificial Intelligence change everything. No thanks, I already know the future.